While obviously not designed to be used as a tablet, the Horizon boasts a large built-in battery the company says is good for two hours of on-the-go use, though portability is questionable as the unit weighs in at 17 pounds. Lenovo is calling the computer a "table PC" in that it can be used as a traditional all-in-one, but transforms into a huge tabletop screen once its rear kickstand is folded down. When the unit is laid on a table, a specialized user interface dubbed "Moon Dial" pops up, allowing users to interact with the computer from any angle. The Horizon features a ten-point multitouch screen with gesture controls suited for multi-person use either at work or at home. Also available are a number of accessories aimed at family gaming, including joysticks, dice and an air hockey mallet, all of which are designed to interact with the screen. 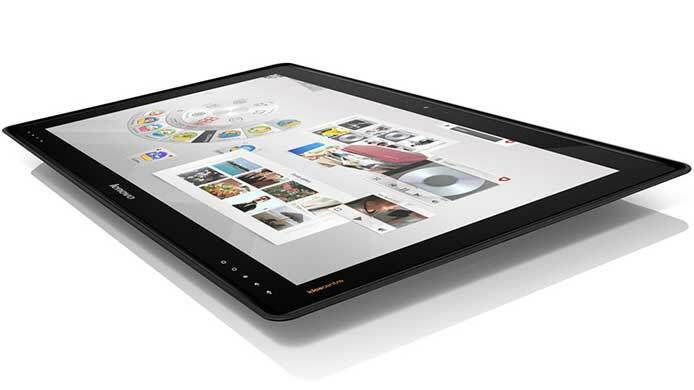 Lenovo calls this functionality "phygital," a combination of "physical" and "digital." In addition to the unique Moon Dial mode, users can switch to the base Windows 8 UI, though the resulting full-screen application windows appear to be somewhat clunky. On its website, the company is branding the IdeaCentre Horizon as a "Tabletop Gaming PC" and lists the expected release date as Summer 2013.